Pitchers Power Drive training aid that increases pitchers velocity potential teams with professional pitcher Daniel Bard to teach that the back leg and hip move the pitcher’s body powerfully away from the rubber into landing. "We are excited to partner with Daniel Bard, professional pitcher with the Red Sox to build awareness at an early age for pitchers to use their stronger lower body muscles to pitch with,” said John Miller, president, of Pitchers Power Drive. Miller said it is very important for youth and high school pitchers to learn to initialize their delivery from knee lift when departing from the rubber by using their hips. It is important to maximize velocity potential and to take the stress off the arm and shoulder. Daniel will bring attention to this as he believes his own power comes from his legs and hips. Even at 6’4” and 200 lbs Daniel believes his power initiates from the ground up. 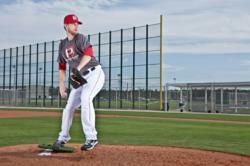 See live pitching video shoot at 1,000 frames per second on the Pitchers Power Drive at http://www.pitcherspowerdrive.com. Daniel Bard will join Drew Storen with the Nationals to help educate pitchers of all ages to use their stronger lower body muscles. Partnering with both a successful smaller and larger framed professional pitchers who both pitch at speeds of 95-100 mph demonstrates the importance of what the Pitchers Power Drive teaches. Both, Daniel and Drew lead with their hips while their knee is positioned over back foot creating a proper leg drive angle driving down the Pitchers Power Drive plate. This allows the entire back leg and hip to move the pitcher’s body powerfully away from the rubber into landing. All Professional Pitchers with above average velocity shift their weight this same way for which the Pitchers Power Drive teaches. Pitchers want to learn to be the best they can and to take stress off their arms and shoulders said Miller. Top professional, collegiate and high school pitchers are improving velocity and performance on the mound. They like the auditory click and kinetic feedback as it helps them hear and feel their lower body being the power of their delivery. Pitchers Power Drive maintains an “Owners Only” web base training site at no charge. Miller said this site is updated to help pitchers advance their training. When Professional and College coaches share new training drills using the Pitchers Power Drive we update to share with our owners. Both Daniel Bard and Drew Storen will join other professional pitchers and coaches on the owner’s site. Pitchers Power Drive is based in Holliston, Massachusetts. They are the developer of the US patented Pitchers Power Drive Professional / Collegiate model and the Pitchers Power Drive Youth model. They also designed the Hitters Power Drive, Softball Power Drive and Golfers Power Drive. The design of the Power Drive Training Aids comes from their extensive experience working with and training pitchers and hitters at the Winning Pitchers Baseball Academy. Pitchers Power Drive is a trademark of Pitchers Power Drive. To learn more about Pitchers Power Drive visit the Pitchers Power Drive website. You can also follow Pitchers Power Drive on Facebook, Pitchers Power Drive on Twitter, Pitchers Power Drive on YouTube, and on the Pitchers Power Drive Blog.